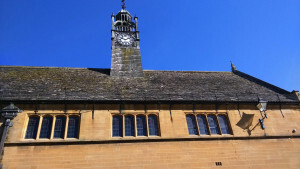 Where is Father Brown Filmed in the Cotswolds Copyright BBC. The highly successful and popular BBC drama series 'Father Brown' is set during the early 1950s is based on the stories by GK Chesterton, in the fictional village of Kembleford. Kembleford is in actual fact Blockley, where Father Brown is a priest at St Mary's Church. Father Brown's aim is to solve the many murders in and around Kembleford. The local bumbling police inspector having very little common-sense and often arrests the wrong suspect, tends to become annoyed by Father Brown's antics and successful deductions to solve the cases. Church of St. Peter & Paul (Blockley). Father Brown’s kitchen, study and presbytery, as well as Kembleford’s police station, (Peelers Court, Moreton-in-Marsh Hospital). Railyway Scenes, (Warwickshire Steam Railway & Winchcombe Station). (Guiting Power) has been used as part of Kembleford village. Quaker Meeting House (Broad Campden), "Kembleford Parish Hall". At (Sudeley Castle), the tithe barn and St Mary's Chapel are used. The local (Donnington Brewey) has appeared several times. 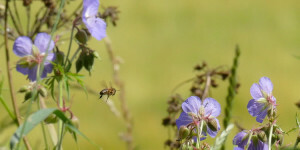 Other locations and villages are used such as (Upper Slaughter), (Upper Court, Kemerton), (Sezincote House), (Ilmington), (Chastleton House), (Alscot Park Estate), (Snowshill Manor), (Lonborough). This is a nice little tour of the various filming locations where "Father Brown" has been filmed. 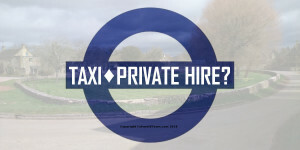 You are taken out into the countryside in a local council licenced tour guide for the tour which can last as long as you require, as you can request tours per hour. The guide/driver's family has lived and farmed the Cotswolds for many generations and provides you with history, knowledge, information and anecdotes. 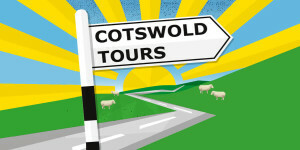 Please contact us at Cotswold Tours to book a guided private tour around some of the most beautiful locations. Book a Tour.